The Fluke 115 Field Service True-RMS Technicians Multimeter is a compact meter for field service technicians and it is also the solution for a wide variety of electrical and electronic testing applications. It includes a 4mm silicone test lead set, a user manual and an installed 9V battery. 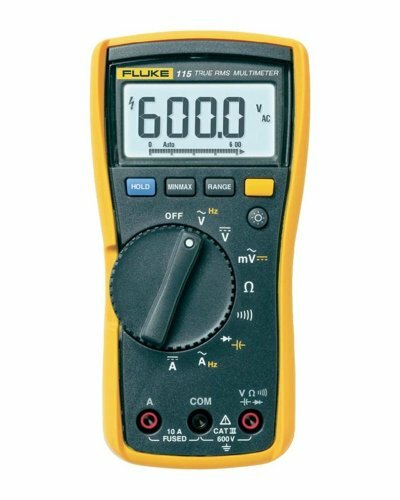 The Fluke 115 displays true-rms voltage and current readings with 6000 count resolution, test diodes frequency, continuity and capacitance and provides Min/Max/Average readings to record signal fluctuations. A large white LED backlight aids work in poorly lit areas. Its easy-open battery access door makes battery changes a snap. It has been independently tested for safe use in CAT III 600 Volt environments Fluke Corporation is the world leader in the manufacture, distribution and service of electronic test tools and software. Since its founding in 1948, Fluke has helped define and grow a unique technology market, providing testing and troubleshooting capabilities that have grown to mission critical status in manufacturing and service industries. From industrial electronic installation, maintenance and service, to precision measurement and quality control, Fluke tools help keep business and industry around the globe up and running.